Supreme Court restricts EPA's ability to curb mercury emissions. 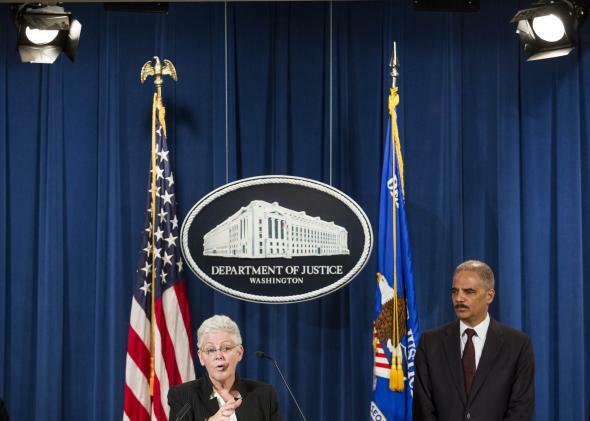 The Supreme Court delivered bad news to EPA Administrator Gina McCarthy on Monday. Above, McCarthy is pictured with former U.S. Attorney General Eric Holder. The Supreme Court curbed the EPA’s ability to regulate mercury emissions from power plants on Monday by a 5–4 vote. In an opinion by Justice Antonin Scalia, the court held that the EPA did not properly take into account the cost to plants complying with the new standards. The EPA had argued that it did not need to consider these costs until later in the regulatory process. Scalia, joined by his fellow conservatives, holds that the EPA’s refusal to consider these costs when creating the mercury regulations was unreasonable.